At the northeastern end of the island is the "Lalaria" beach, one of the most beautiful of Greece. The breeze falls furiously on the steep white-white rocks, standing imposing over the sea and creating, for millions of years now, the full-round, white pebbles the "lakes" that cover the entire beach. The well-known "Trypia Petra" stands guard on the edge of the beach. Megali Ammos is only 3 km away from Skiathos Town and is one of the most popular beaches on the island. Because of its location, it is often linked to bus routes from the city but it is accessible and on foot which is just 5 minutes walk away. The beach has golden fine sand and clear waters. It is organized with sun loungers and umbrellas, along which you will find many seaside taverns and cafes. There are still many water sports centers to enjoy a fun day in the sun. 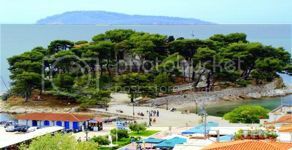 Bourtzi is a small peninsula in the port of Skiathos, formerly a fortress. It was founded by the Gizy family, who captured Skiathos in 1027. The fort was surrounded by battlements and battlements, while left and right of the gate had two round towers. Bourtzi was also called "Kastelli of St. George" in the past, due to the small church of St. George that existed within it. It was destroyed in 1660 when occupied by the Venetian Admiral Morozini, and in 1823 it was the bastion of the Revolutionaries against the Turks and after liberation it served as a sanctuary.